A forum providing hot tub maintenance and aftercare advice is being hosted by thriving retailer and 1 Stop Spas chief Chris Brady during the Hot Tub Living Expo at the Birmingham NEC next week. During his first appearance as an exhibitor at the two-day hot tub and swim spa showcase, running on Monday, October 24, and Tuesday, October 25, in Hall 11 of the NEC, leading Marquis and Vita Spa hot tub and swim spa dealer Chris will also be helping to promote best practice policies and ways in which retailers can help improve aftercare to customers during a special forum session. Organisers of the Hot Tub Living Expo have invited industry experts to take part in the free seminar and forum schedule throughout the two days of the wet leisure extravaganza and Chris, as part of his SpaTech Training promotion, will be running the ‘Hot Tub Aftercare and Maintenance Forum’ from 11am on Monday. The forum will be covering three main subjects. These are scheduled to be: ‘Calcium Stearate – What is it and what can be done about it?’; ‘Cowboy Traders – Unsafe practices and how it can be combated’; ‘Education and Training – Training our way to a more professional industry’. “The aim of the forum is to engage with hot tub technicians and aftersales professionals over the issues and concerns about aftercare and maintenance as well as providing a platform to share industry best practice,” said Chris. During the Hot Tub Living Expo Chris, pictured, will also be promoting various DryCase and SteelCore products to trade visitors to his 1 Stop Spas stand. Exclusive offers, dedicated to purchases that are signed during the exhibition, are also being provided to prospective retailers as part of the inaugural British exhibition exposure for the brands. Anyone who purchases £500 worth of DryCase Products, which have gained publicity to prospective consumers in the Hot Products section of the latest edition of WhatSpa? Magazine, for their showroom will receive a free counter top display that is worth £120. Chris is also providing a 10 per cent discount on all orders placed for the SteelCore Security Straps during the Hot Tub Living Expo. “There is demand from retailers for these products,” reported Chris.“As a retailer you have always got to be moving forward with enhancing your showroom and introducing new products. 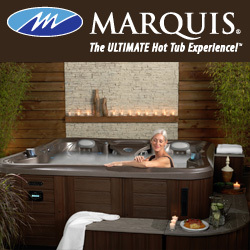 “If you want people to come and visit your showroom then you have to make every effort to generate publicity for it and make it an attractive destination with plenty of choice of quality hot tubs and swim spas and accessories. For further details about how the DryCase and SteelCore products distributed in the UK by 1 Stop Spas can enhance your dealership profitability visit Chris on the 1 Stop Spas stand at the Hot Tub Living Expo, which will be open to trade visitors from 10am to 5pm on Monday; and 10am to 4pm on Tuesday. A special VIP Evening will take place at the NEC on Sunday, October 23, from 5pm to 8pm.